A workshop to make your tractor dealer envious. 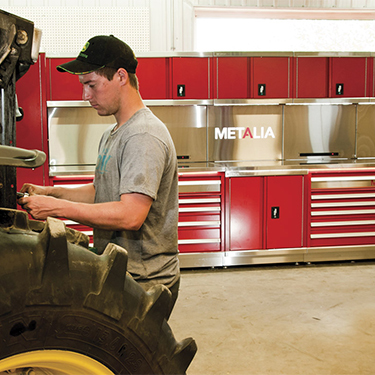 To maximize the maintenance of its machinery and buildings, Lisand Farm from Saint-Marcel-de-Richelieu, purchased a Metalia workstation that would make any tractor dealer jealous. “We are better organized and since we lose less time looking for our tools, we perform better” explains André Pétrin, owner of Ferme Lisand with his wife Lise Lapolice. “We got interested in Metalia at the Uni-Select Expo-Vente in September 2014, and then our sales rep helped us find the perfect configuration” explains Alexandre Pétrin, oldest son of the family and main user of the workstation. The secret? 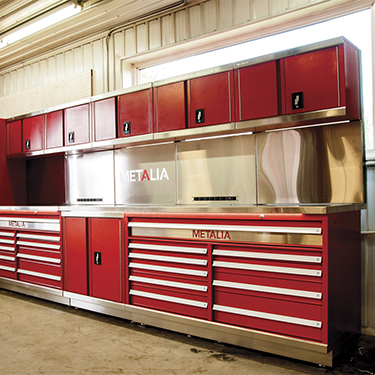 The high density storage offered by the drawers and cabinets of the Metalia workstation, replacing regular shelves and workbenches. With 440 lb of storage capacity, each drawer can be filled with parts, tools and shop supplies, keeping everything at the same place. “The 100% opening helps us find our tools faster because we see the whole drawer at a glance,” confirms M. Pétrin. The LED lighting system, unique to the Metalia toolboxes and workstations, offers unrivalled visibility on the content of the drawers and on the work surface, eliminating the need for handheld or external lighting. “It’s more fun to work in a neat and well-organized workshop” confess the owner, proud of his new station. Partitions and dividers, integrated in all drawers, also eliminate the loss and unnecessary purchase of hardware. A neat Worksop also helps to keep good workers, which is essential in every business. “We are really proud of our Metalia workstation - it fits the image of our farm,” concludes M. Pétrin.